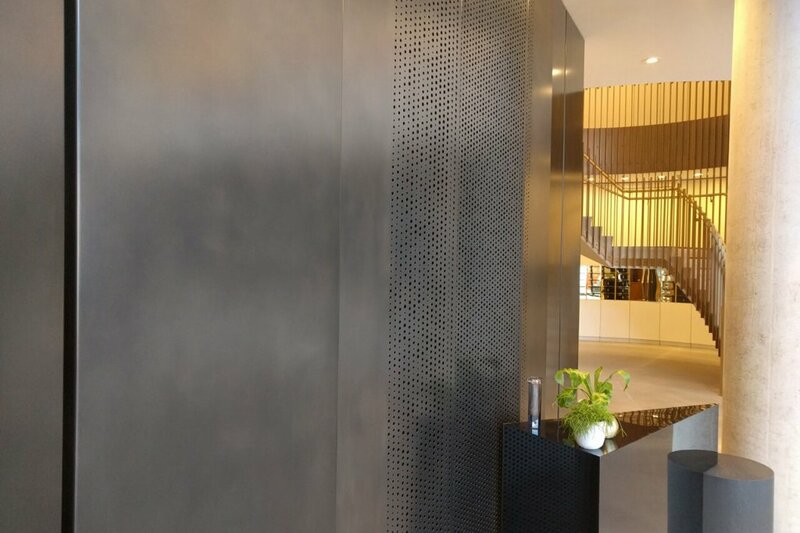 Increasingly popular in building design, chemical blackening (or browning) produces an industrial-style decorative finish on interior steel features. Giving a classic aged look to the metal, it’s used in internal environments from office development reception areas to bar fronts. It’s also an effective and practical finish for wall cladding and partitions. At Bradleys we provide hand-crafted, blackening services for mild steel, which is then sealed with either a natural wax or low sheen lacquer. We can deal with all kinds of fabricated items, large and small, including flat panels, perforated panels and staircases. Also known as chemi-blackening or cold blackodising, it is an excellent aesthetic industrial approach to coating steel products in view of the public space. At Bradleys Metal Finishers we believe in the maintenance of consistent high quality. We have built a reputation over 50 years in the industry for the quality of work and the quality of our services.